In a fresh round of controversy involving Sadhguru Jaggi Vasudev, founder of Isha Foundation, a non-profit organization which offers yoga programs around the world and claims to be involved in social outreach, education and environmental initiatives, has referred to a Muslim student at the prestigious London School of Economics (LSE) as “a Talibani” and “Taliban”. Earlier Sadhguru invited criticism from the well-known anti-dam organization, Narmada Bachao Andolan (NBA), for his Rally of Rivers campaign, allegedly meant to support of the establishment, and playing in the hands of India's corporate interests. In 2017, NBA accused Sadhguru of gathering “millions of rupees from many corporate and many media houses” for his campaign. 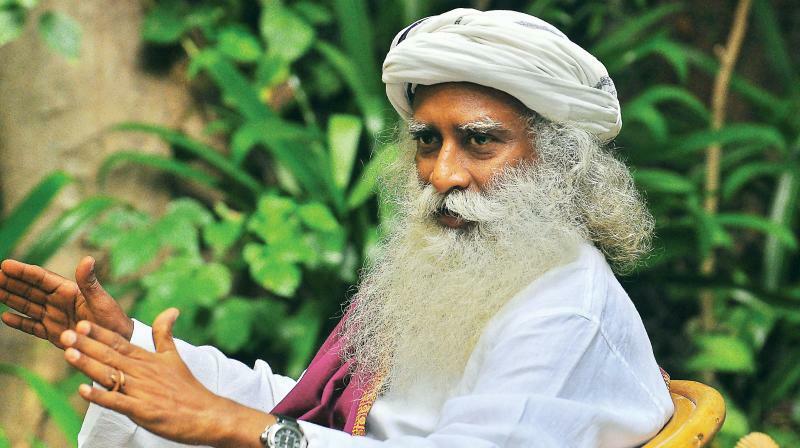 NBA said, Sadhguru, “who has taken up to saving the rivers by spending millions of crores of rupees himself is accused of violation of many environmental laws in Tamil Nadu”, including “encroachment on the Kundakoi tributary of the river Noyal, construction of ashram with nearly one thousand buildings on the reserved forest, encroachment on the elephants corridors”, etc. LSE Students Union (SU), responding to Sadhguru’s “Talibani” comment following the “Youth and Truth: Unplug with Sadhguru” event has sharply reacted to the mystic, saying, his words do offend, even though a clarification was issued later on. There have been reports that, subsequent to the event ‘Youth and Truth: Unplug with Sadhguru at LSESU, Sadhguru (Jaggi Vasudev) called a Muslim student at the LSE “a Talibani” and “Taliban”. The LSESU is deeply disappointed in Sadhguru’s comments and views them as Islamophobic. The LSESU confirms that such comments do not have a place on campus and are to be condemned. If the comments were made in jest, this does not lessen their impact – the words still offend. Such incidents, if not duly denounced, aggregate to create a culture where casual Islamophobia becomes acceptable and, as such, we implore Sadhguru to release a formal apology to the student body with regards to the statements made. This is addressed to all those concerned, Bilal Bin Saqib – the London School of Economics student with whom I had interactions, and two students who were with us as part of Youth and Truth. Bilal is a wonderful young man, having aspirations to make an impact in the world, particularly in his country. The last thing I have is any ill-will or intention to abuse or insult him. It did not come out this way at any point in the conversation. It is not in my heart to insult anybody, especially not this wonderful young man with so many aspirations and intentions for the world. This small video clip of a private conversation, which has been mischievously edited, is unfortunate. I would like to tell all those concerned that the word ‘Taliban’ in Arabic means an ‘ardent student’, which Bilal definitely is, as also the other two students are. This term is always used in India in relation to someone who is over enthusiastic. It is in that context that I was joking with Bilal, it is very unfortunate that it has been projected this way. If this has in anyway offended or insulted anybody, this was not the intent. This private conversation was mischievously edited, with what intent, I am unable to fathom. I wish to anyway apologize to the London School of Economics and the Students Union, if it offended any of you in some way. My gratitude to the London School of Economics and the Students Union for having organised this event. LSESU stands firmly on our above stance and deem the comments to be Islamophobic. We do not believe the video was "mischievously edited” and have heard no reports supporting the common use of ‘Taliban’ in India as meaning over-enthusiastic. We believe that individuals who have many followers, hold power and status, and claim to promote tolerance, should be aware of and sensitive, to the political and extremist connotations attached to the word ‘Taliban’ in our current context. Casual Islamophobia such as this perpetuates the culture of misunderstanding and judgement. This is especially relevant given recent spates of terror against Muslims in Britain, New Zealand and around the world.